A couple of months ago I reviewed my first book here on 90’s Horror Review called The Reading Buddy. I had a lot of fun discussing the 90’s homage, and thought it would be interesting to go back and pick up an actual 90’s teen horror book. So, I took a trip to the used book store and ran across some Fear Street books, and like a mature adult, I picked out the one with the best looking cover. I took it home and dived right in, and let me tell you… I had a ton of fun. I don’t know why I skipped over these books as a teenager, but at least in this case, the book feels like a more mature version of a Goosebumps book and I like that. It’s easy to read, short, and just something fun to flip through when you got a few moments. I went back to the bookstore and picked up several more, along with some Point Horror books that I plan on reviewing in the future. Until then, enjoy my review of my first Fear Street book, The Second Horror from the 99 Fear Street: The House of Evil series. I remember loving the front covers of the Fear Street books, but I never actually popped one open and read it. I believe that I felt like they were a little beneath my reading level and I just preferred to read Stephen King if I was going to read horror. My stupid arrogance caused me to miss out on a fun series of books during a time when they were mass produced and available everywhere. 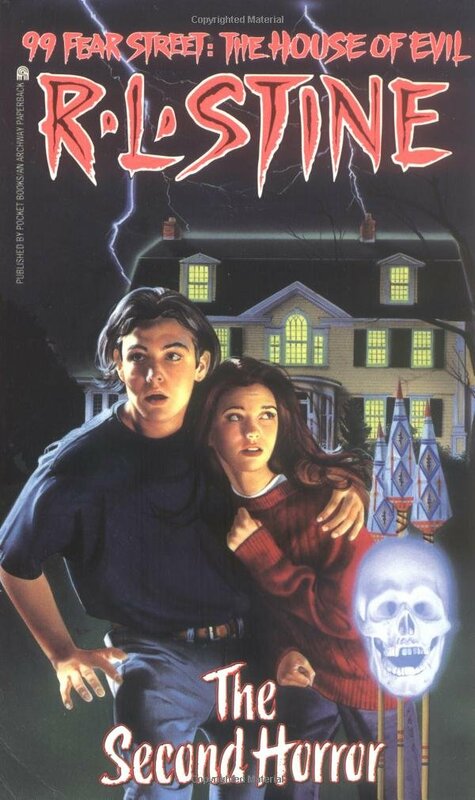 As I mentioned earlier, this is my first Fear Street book and I read it over the course of a week in March 2018. Brandt McCloy and his folks move into a house on Fear Street with a troubling past. Things seem to go well for Brandt after he catches the attention of three young women in town, but what he doesn’t realize is that he’s caught the attention of a fourth: Cally Fraiser a ghost who haunts his new home and is insistent on destroying him and everyone close to him. -This book is actually the second book in a series of three books. Despite picking up the second book without having read the first, I was able to pick right up and enjoy the story. I’m not sure if the first book would have enriched the story for me, but I never once felt lost or out of touch with what was going on. -Brandt’s a likeable average guy. It’s strange because usually when dealing with teen entertainment, you see things from the perspective of a nerd or the school hero. In this book, Brandt is very normal. My reaction to him and what he does at times is very neutral. For example: when he begins garnering the attention of several ladies, Brandt isn’t overly impressed nor is thanking his lucky stars. He’s just very neutral about the whole thing, which is strange to see, but refreshing. -The book starts off with an act of “accidental” violence that is damn graphic and was unexpected, especially when reading the book with my cat napping next to me. It helped me realize that Fear Street wasn’t Goosebumps and this RL Stine was less restricted in how he approached horror. -Technologically we are in an age where most of our gadgets can help prevent horror from happening, or at least can get us help when it starts occurring. This is an issue that everyone working in horror has to deal with by either finding a way to disable technology or acknowledging it and working it into the narrative. It’s refreshing to read a horror book that doesn’t mention texting and where you feel like the characters are really cut off from one another unless they are in the same room. -The story had a twist at the end that I didn’t 100% see coming. I knew something was up by the constant teasing of something being wrong with Brandt, but I really thought the twist worked and was a lot of fun. It kinda gives you a Tales from the Crypt type vibe. -I’ve noticed over the past several years that my attention span has grown smaller when it comes to reading. I’m great with short stories and small novels, but I rarely bother with anything over 400 pages anymore. Fear Street books clock in a little over 100 pages and they are a fast, easy read. Many of the chapters end mid-scene as a sort of mini-cliff hanger that keeps you reading. This isn’t so much a review of the book itself, but of the format and I absolute love it. -When you write a 120 pages book, you don’t have a lot of room for character development. I’m actually okay with that. I would prefer to read 120 pages of shallowly defined characters than 300 pages of masterfully written backstories and motives when it comes to a horror story. -Horror, especially teen horror (well any teen entertainment in the 90’s), tends to be a bit cliché at times. You have the nerds, jocks, pretty girls, pretty girls who think they are ugly, etc. etc. Outside of Brandt, The Second Horror does nothing to break this tradition. I’m not saying it’s needed, but it would be nice to read a character that didn’t act exactly the way you expected them to act. -I’ve never been a fan of island/indigenous folklore when it comes to horror and while this worked as a great vehicle for some of the plot, I’m just not a fan. To properly review The Second Horror, I have to looked at the book and story from a proper point of view, that of a 90’s teenager. It would be easy to look at this book and criticize it for being short, lacking true development, and not bringing enough horror, but you must look at the audience this book was written for and the time that it was written. With that being said, if you are a grown adult with no nostalgic memories of these type of books or someone who prides themselves on only written “intellectual” type books, then this is a definite skip for you. For someone like me, who loves 90’s horror and missed out on these books, this is a goldmine. It’s an untapped resource of 90’s horror for me to experience for the first time all over. This wasn’t Stephen King and I know that and I’m okay with that. The Second Horror was a quick, easy read that gave me some small frights and entertained me quite a bit. It reminded me a lot of Are You Afraid of the Dark, just a little darker. I rate 99 Fear Street: The Second Horror as a seven out of ten and say it’s worthy of picking up for a buck or so if you want something different to read. I was thirteen years old when Se7en came out and once the movie hit video my dad rented it. He was always a big fan of serial killer movies and Se7en looked like something he’d really enjoy. I sat down with him on a rainy Saturday afternoon and neither one of us were prepared for what we were about to see. Sometimes you’ll hear movies described as unflinching, but its rarely applicable. With Se7en, it’s quite fitting. I re-watched Se7en in August 2018 and found the movie to still be incredibly powerful. A young detective partners up with a retiring detective to track down a serial killer who is using the seven deadly sins as motivation. -The atmosphere this movie creates is amazing. It’s dirty, rainy, and hopeless. I rarely watch a film and come away with total despair but this film does that for me. It turns on a mirror on the worst parts of humanity, life, and the world that we live in and for two hours it makes you stare at it without ever letting up. -The acting is phenomenal all around. Morgan Freeman does an incredible job as the desensitized veteran, Brad Pitt is the wonderful overly anxious up and comer demanding respect, Gwyneth Paltrow is the sweet and frustrated wife of Brad Pitt, and the killer is exceptional in his performance as well. -The horror and gore in this film are things that will stay with you. Thankfully CGI wasn’t used all that much in 1996 and the deaths were all practical from what I could tell. And whoever designed them spent hours pouring over pictures of actual corpses because the work here is believable and not easy to look at it. -The twist. I won’t say more, but the twist. -The story is simple, very noir, and well told. Director David Fincher is an amazing storyteller and I still consider this his masterpiece. -Things feel real in Se7en. You’re watching a film about horrendous crimes, but everything feels like is actually happening, almost like it’s a documentary that you are getting to peak in on. I think Fincher’s unwillingness to turn the camera away from the difficult moments creates this unique feeling. And I’m not just talking about crime scenes, but the dinner scene really stays with you as you get to see a different type of pain from all three of the main characters. -The New Line executives apparently hated the ending, but Brad Pitt refused to do the film if the ending was changed. -During the scene where Mills (Brad Pitt) chases John Doe, Brad Pitt fell and his arm went through a car windshield and he had to have surgery to repair it. The accident was worked into the script. -All of John Doe’s books were real books written for the film. They cost $15,000 dollars to make and it took two months to complete them. -Brad Pitt bought his own ties for his character. He wanted him to appear to have bad fashion sense. -Brad Pitt did the film to escape the typecasting of heartthrob that he had received after doing Legends of the Fall. -David Fincher did the film only because he could control the movie since his experience on Alien 3 was horrific and plagued by studio interference. -No one expected Morgan Freeman to sign on, but he did so eagerly. -Seven crates of cockroaches were brought onto the set for the gluttony victim. The actor, Bob Mack, had his nose and ears plugged to keep them from crawling in, but they still managed to work their way into his underwear. -The dark look of the film was accomplished by bleach bypass, which occurs when the silver in the film stock is not removed, so it deepens the dark images, and increases the overall tonal quality. Se7en is one of those films that is perfect to me. There is nothing I would change about it. The casting, the cinematography, and the story are all top notch. The only question one might have about this film is my inclusion of it as a horror film. Serial killer films fall into a strange territory that is part horror and part thriller, and this film is no different. There is obvious gore and even a giant jump scare, but is it truly horror? I’ve never been able to make up my mind about the thriller/horror category. I really think its up to the individual to determine whether its horror or not. Personally, I would not classify Se7en as horror, but since I think a lot of people would I felt like it was a worthy addition to the site. 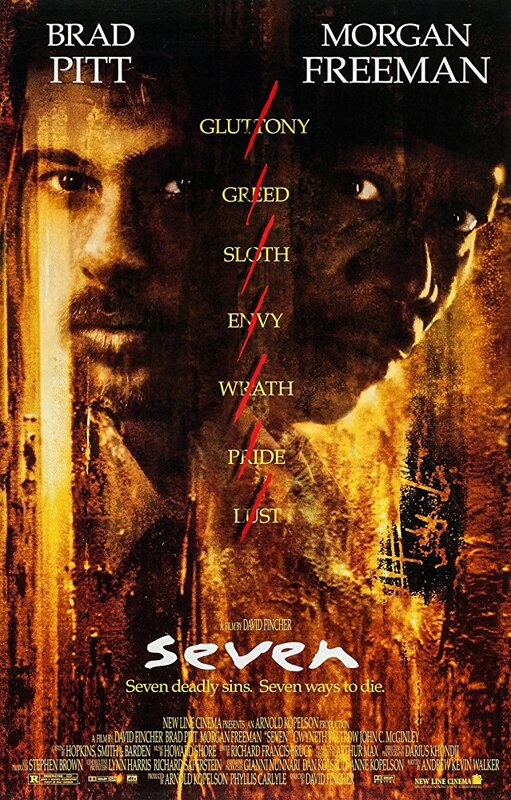 Se7en is a five out of five from me and is a must see. It’s not a movie I’d watch annually, but it is an amazing film that holds up well over twenty years later. My most recent re-watch occurred this past weekend, following Hurricane Florence’s attack on North Carolina. I was lucky and retained power all weekend, and when I started thinking of films to watch The Mist came to mind immediately. A few months ago, I purchased a copy of the black and white director’s cut on Vudu, and this seemed like the perfect time to give it a watch. Following a bad storm, a sinister mist rolls into a small Maine town and terrorizes a group of civilians hiding out in a grocery store. -The Ending. You’ll get no spoilers from me on this one, but the ending is incredible. -The film plays out like a Twilight Zone episode in some parts. There is a lot of analysis on how people react when scared and under pressure, and this film doesn’t shy away from showing it in all it’s terrible glory. -The cast is wonderful. Thomas Jane (Deep Blue Sea), Marcia Gay Harden (Mystic River), Andre Braugher (Frequency), William Sadler (Disturbing Behavior), and pretty much a casting call for The Walking Dead with Melissa McBride, Laurie Holden, Jeffrey DeMunn, Juan Gabriel pareja, Cheri Dvorak, Sam Witwer, and Tiffany Morgan. -Every character is rounded out enough that you feel a connection to them. I’m not saying that every death is impactful, but you never feel like the movie is just offering up nameless bodies to The Mist. -Horror films get a lot of flack for having some terrible acting (rightfully so in a lot of cases) but this film is an exception. The performances all around are pretty wonderful with no major weak links coming to mind. -The music is subtle, but fits well. I really noticed it while wearing headphones and came to appreciate it. -The CG was below average in 2007 and of course only looks worse in 2018. Every time I see something in CGI, I’m reminded of the Gravelings in Dead Like Me, a TV show from 2003, which is not a good thing. Luckily, if you watch the film in the black and white edition (which I recommend), it helps mask some of the cheesier aspects of the CGI. -The pacing is a little strange in The Mist and it feels like a much longer movie than it actually is. I’m not saying the pacing is bad, but it’s not your standard three act story, so you have be prepared for the storytelling to come and go in waves. -This was writer/director Frank Darabont’s third Stephen King adaptation after The Shawshank Redemption and The Green Mile. -The opening scene shows David (Thomas Jane) painting The Gunslinger from The Dark Tower. -To save time on the tight schedule, Frank Darabont hired the camera crew from the TV show The Shield to shoot the film. They were used to moving on a fast paced, hectic TV schedule. -Frank Darabont had imagined the ending for twenty years and wanted to make his version of The Mist. He turned down $30 million dollars to make this film with a modified ending. Instead, he made the movie for half the amount and forfeited his directorial salary. -Frank Darabont originally wanted Thomas Jane to play Rick Grimes in The Walking Dead after shooting this film with him. -Thomas Jane’s third Stephen King movie, the other two being Dreamcatcher and 1922. -William Sadler portrayed David Drayton in the audio drama version of The Mist. He was also in two Stephen King adaptations: The Shawshank Redemption and The Green Mile. -Frances Sternhagen’s third appearance in a Stephen King film, the first two being: Misery and Golden Years. 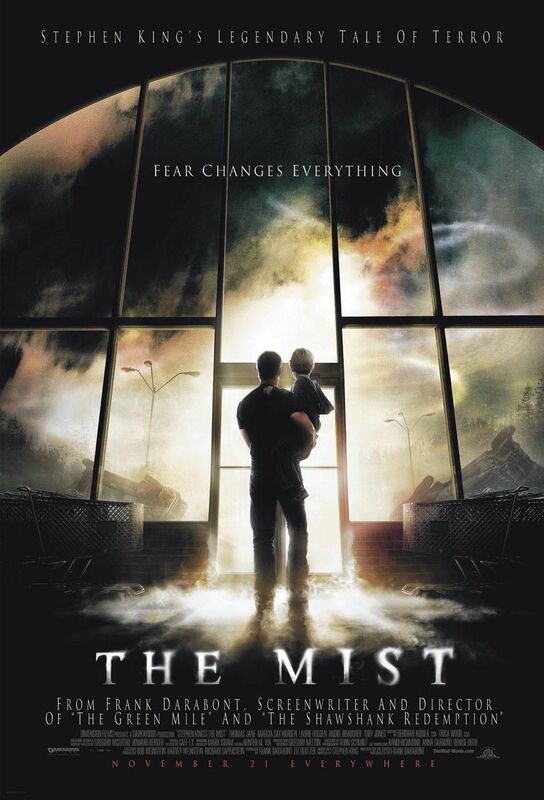 I loved The Mist the first time I saw it and I think I love it just as much now. I love a good isolation story and it’s even better when grounded in something I can relate to like a grocery store. It’s not difficult to watch The Mist and see how it laid some of the groundwork for the first season or two of The Walking Dead. The story feels real and the actual conflict isn’t so much The Mist as it is the other people around you, which is a topic I never tire of seeing discussed whether it’s in the before mentioned Walking Dead or The Monsters on Maple Street episode of The Twilight Zone. I do recommend watching it in black and white if you are willing to, and would rate the film a solid four out of five. I always assumed that Teaching Mrs. Tingle was a horror/comedy film. Then I finally got around to watching it in early 2018 and realized that there was nothing horror related about this film at all. Similar to my review for Gossip, I've decided to press on with the review because if I was misled by the marketing, I'm sure others were too. After being accused of cheating, three high school students accidently take their teacher hostage. -I love the cast of this film. You have the always great Helen Mirren joined by Jeffrey Tambor along with the kids: Katie Holmes, Barry Watson, and Marisa Coughlan. It's an excellent cast who all do well by their characters. I was especially impressed with Marisa Coughlan and am surprised that this wasn't a huge breakout role for her. -Once I got over the shock that this wasn't a horror film (maybe I was mixing it up with Teaching Mr. Griffin?) I started enjoying the movie. It's mostly a comedy that does have a little heart. Having come out in 1999, I could see how this film may not have found its audience though. It's not quite cute enough to be in the "She's All That" group, not funny enough to be like "10 Things I Hate About You" and not gross enough to be in the "American Pie" camp. It's a film that stands alone in its own little genre and I can see why the marketing department had such a hard time selling it. -I love Kevin Williamson's dialogue and it's on full display in Teaching Mrs. Tingle. Lots of random references and fast, intelligent discussions. -The movie is not good. The script is lacking any real substance and it feels thrown together. The film never knows what it's setting out to say and because of that you feel lost throughout the entire movie. I think the cast was really dedicated to their roles, they just didn't have enough to work with. Despite all of Katie Holmes charming attributes, it just isn't enough to save this film. -The film was originally titled Killing Mrs. Tingle, but after the Columbine shooting the movie was pushed back and retitled to Teaching Mrs. Tingle. -Gillian Anderson turned down the role of Mrs. Tingle. -The film was originally shot to be R-rated but the studio decided to try and maximize their profits by turning into a PG-13 film. Killing Mrs. Tingle was a disappointment and not just because it wasn't a horror movie. I have a feeling that the studio snatched up the script because Kevin Williamson's name was on it and at the time he could do no wrong. Teaching Mrs. Tingle is a five out of ten.